Childe Hassam, Church at Old Lyme, Connecticut, 1905. Oil on canvas, 92.07 x 81.91 cm. Albert H. Gracy Fund, 1909. Collection of the Albright-Knox Art Gallery, Buffalo, N.Y. Sometimes even a single manuscript I stumbled across while researching Darkness Falls on the Land of Light overturned everything I thought I knew about New England’s era of great awakenings. Consider the stunning letter (below) by Joseph Higgins, a coastal trader and merchant from Old Lyme, Connecticut. In 1743, Higgins dispatched this strident missive to an unnamed clergyman. The recipient was likely Charles Chauncy, Boston’s vociferous opponent of the Whitefieldian revivals. Higgins was aiming to blow the whistle on his own minister, Jonathan Parsons. The letter contains a petition in which several parishioners in the Lyme Congregational church accused Parsons of nearly three dozen theological and ecclesiastical errors. Here’s the unusual part: Parsons ranked among the most successful and respected ministers in eighteenth-century New England. Historians frequently point to his published account of the religious stir in Lyme—which was serialized in an evangelical magazine called the Christian History—as the paradigmatic revival narrative of the colonial era. In later years, Parsons presided over one of the largest congregations in New England: Newburyport’s Old South Presbyterian Church, the final resting place of George Whitefield himself. But the figure in Higgins’s letter is nothing like the temperate clergyman of revival literature. Parsons abandoned all decorum in his church services and opened his pulpit to an array of gifted lay people. He brazenly declared that whores, witches, rakes, and hell hounds would find their way to heaven long before the “old Gray hedded” communicants his church. One of the aggrieved brethren even recalled hearing Parsons gloat that he would stand as a witness against unconverted sinners on the Day of Judgment; and he prayed aloud that hellfire might blaze out of their mouths. Most ominously, the Lyme minister zealously endorsed the “Enthusiastick Doctrines & Practices” of the most incendiary New Light itinerant of the era, James Davenport. After discovering Higgins’s extraordinary letter, it took me several years to piece together the entire controversy. The search lead me first to the Massachusetts Historical Society in Boston; then to the Connecticut Conference Archives of the United Church of Christ in Hartford, the Library of Congress in Washington, and the William L. Clements Library at the University of Michigan; and finally to a unique cache of church papers at the Florence Griswold Art Museum in Old Lyme. The Lyme controversy is one of my favorite sections of Darkness Falls. It’s a powerful example of the social and ecclesiastical costs of the Great Awakening—something scholars have been slow to acknowledge. Even still, the story of Lyme’s checkered religious history was quickly forgotten. Early in the twentieth century, artists and literary recast Lyme as the quintessential New England village. Immortalized in the vibrant colors and bold brushwork of American impressionist Childe Hassam, the Congregational meetinghouse emerged as an icon of simpler times, a pre-industrial community bound together by town and church. Higgins’s 1743 letter to an unidentified clergyman is part of the collections of the New England Historic Genealogical Society in Boston (Mss. C 1345). For a detailed analysis of the Lyme controversy, see Darkness Falls on the Land of Light: Experiencing Religious Awakenings in Eighteenth-Century New England (Chapel Hill, N.C., 2017), 333–352. Jonathan Parsons published his “Account of the Revival at Lyme West Parish. . .” in Thomas Prince, Jr., ed., The Christian History, Containing Accounts of the Revival and Propagation of Religion in Great Britain & America (Boston, 1744), 118–162 (for excerpts, see Alan Heimert and Perry Miller, eds., The Great Awakening: Documents Illustrating the Crisis and Its Consequence [Indianapolis, Ind., 1967], 35–40, 187–191, 196–200). Additional documents relating to the Lyme revival appear in Richard L. Bushman, ed., The Great Awakening: Documents on the Revival of Religion, 1740–1745 (Chapel Hill, N.C., 1969), 40–42, 53–54. 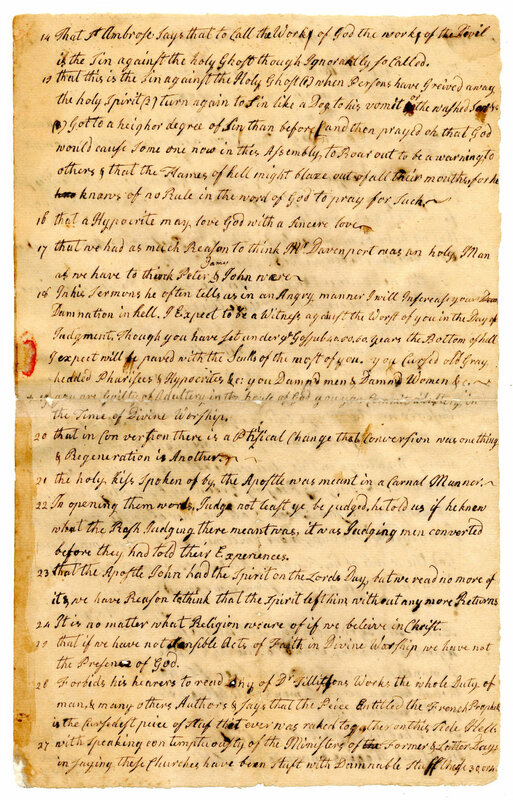 See also the Records of the New London Association, 1708–1788 (available online at the Congregational Library’s New England’s Hidden Histories: Colonial-Era Church Records New England's Hidden Histories digital archive). Click image to view in NEHGS Digital Collections. 1. With Approving Attending & Encouraging Separate Meetings for Religious Worship. 2. With Allowing Approving & Encouraging Persons when moved with Imperssions (that are Common Among us) to Cry out with a loud voice in the Time of Divine Worship to the Disturbance of the Worshipping Assembly. 3. With Inviting & approving Unqualified Persons to preach & to Exhort the People such as Thacher Prince &c.
4. With Breaking Covenant with this people by Going to Long Island, to preach without any Necesary Call, when he knew the Church was in Great Danger of being led away from the Simplicity of the Gospel by the Enthusiastick Doctrines & Practices of Mr. Davenport. 5. With Recommending a Theif (Prosecuted found Guilty & [Recorded]) to the Charity of a Neighbouring Church without any Christian Satisfaction, tho he well knew the whole Matter. 6. With using his Endeavours to Admit a Baptist that had Apostatised from her Profession to Occational Communication with this Church. 7. With making an Unscriptural & unwarrantable Difference between Chirch Members of a Good standing in the Church by Giving the Appelation of Dear Brothers to Some & not to others (the new Lights are the Dear Brothers). 8. With Admitting Persons into the Communion of the Church that are Grossly Ignorant of the Principles of Religion &c.
9. With forbiding unconverted Persons to sing the 23 Psalm & such like Psalms. 10. With Publickly declaring Persons are converted Immediately upon their Experiences of these things, viz. : Distress & Terror of Conscience for Sin & their being afterwards filled with Joy, &c.
11. With Callumniating the Civill Authority (both in prayer & preaching) by Intimating that many of their Dictates are Unlawfull & unjust to be Imposed upon a Christian people terming of them Tyranny & a Bloody Inquisition &c. Praying that they people might not submit in Matters of the least Indifference. 1. That we have no Reason to think a man in a Goodd State let his life be never so Seemingly Religious, or Moral until he hath told his Experiences alledge its as a just Inference from our being, by Nature, Children of Wrath. 2. That an External Conformity to the Gospel is no Evidence that a person is a True Christian. 3. That multiplied acts of Gross Sins, yea sins of the Grossest kind is no Arguments or Evidence against a State of Grace. 4. That all Doubting in a Christian of his Good state was from the Devil. 5. That there is more hopes of a profane Swearer, Sabbath Breaker, Drunkard, whoremaster, going to heaven when he dies than that he will, that lives an honest Life & Strives to Serve God as well as he Can. 6. That he knows not but God might Save a Moral man but an hundred to one if he did for it was out of his usual way to save such. 7. He told us in a Sermon from Luke 14:13 that Christ Chose Sailors the worst of men to be his Companions, Highway & hedge Sinners a Company of Whores & Witches. That there was more hopes of a Rake Hell & hell hounds than Moral men & many things of the like Import &c.
8. That if he could get all the people to do nothing towards their Conversion he should not doubt but that they would all be converted in one Month. 9. That if God should Discover his glory to an unconverted person it would cause Hell in his soul & that hell flames would Blaze out of his mouth. 10. For a Person to Infer his Justification from his Sanctification was a Proof that Pharisees & Hypocrites have of their Justification. 11. That a Person Could draw no true Comfort to his own Soul when he does Justice, loves mercy, & walks humbly with God. 12. That he had often heard of a Humble Doubting Christian but never saw one that was a Humble Doubting Christian but was a Mear Chimera in Religion, an Imaginary Monster made up by Hypocrites & an Absolute Contradiction, a thing that never was nor can be & Such as Dream of Humble Christians Doubting were filled with pride & Opposition to God. 13. That Continued acts of Grose Sins of the Gosple Sort was no Evidence of a State of Nature or Sin & Death. 14. That St. Ambrose Says that to Call the Works of God the works of the Devil is the Sin against the holy Ghost though Ignorantly so Called. 15. That this is the Sin against the Holy Ghost (1) when Persons have Greived away the holy Spirit (2) turn again to Sin like a Dog to his vomit or the washed Sow &c. (3) Got to a heigher degree of Sin than before and then prayed oh that God would cause Some one now in this Assembly to Roar out to be a warning to others & that the Flames of hell might blaze out of all their mouths, for he knows of no Rule in the word of God to pray for Such. 16. That a Hypocrite may love God with a Sincere love. 17. That we had as much Reason to think Mr. Davenport was an holy Man as we have to think Peter James & John were. 18. In his Sermons he often tells us in an Angry manner I will Increase your Damnation in hell. I Expect to be a Witness against the Worst of you in the Day of Judgment, Though you have set under the Gospel 40, 50, 60 years the Bottom of hell I expect will be paved with the Soulls [Sculls?] of the most of you. You Cursed old Gray hedded Pharisees & Hypocrites &c. You Damn’d men & Damn’d Women &c.
19. You are Guilty of Adultery in the house of God. [You] Commit adultery in the Time of Divine Worship. 20. That in Conversion there is a Phisical Change that Conversion was one thing & Regeneration is Another. 21. The holy kiss Spoken of by the Apostle was meant in a Carnal Manner. 22. In opening them words, Judge not least ye be judged, he told us if he knew what the Rash Judging there meant was, it was Judging men converted before they had told their Experiences. 23. That the Apostle John had the Spirit on the Lords Day, but we read no more of it & we have Reason to think that the Spirit left him, without any more Returns. 24. It is no matter what Religion we are of if we beleive in Christ. 25. That if we have not Sensible Acts of Faith in Divine Worship we have not the Presence of God. 26. Forbids his hearers to read any of Dr. Tillitsons Works the whole Duty of man, & many others Authors & says that the Peice Entitled the French Prophets is the Cursedest piece of Stuf that ever was raked together on this hole Hell. 27. With speaking contemptuously of the Ministers of Former & Latter Days in saying these Churches have been Stuft with Damnable Stuff these 30, or 40 years & that the Substance of the Doctrines for 40 years past was such Cursed & Damnable Stuff. 28. That in Conversation a Man repents of all Sin both past & future & that Repentance is not necessary after Conversion. 29. That a person may Commit Gross acts of Sin such as fornication & Adultery having Grace in Exercise, yea that Grace in exercise sometimes prompts men to Sin. 30. When a Person was crying out in the meating house after service said Mr. Parsons you that are Dissatisfyed Go & take the words of the holy Ghost from that mans mouth. 31. That we have as much reason to beleive the Present work is the work of God as we have to beleive the Mission of Christ. 1. Praying for the Miraculous Gift of Tongus (2) that Unconverted ministers may be converted or put out of the Ministry (3) that God would Appear in as Visable a manner as at that Memorable Sacrament when there was Crying laughing & talking even every thing [allmost] Imaginable. But Sir Mr. Parsons hath been well satisfy’d for 4 years. But this Day we had a Meeting & now he Demands £320—£350 in the Room of £240: though a very holy man & quite left of[f] Caring for this Worlds Goods. P.S. I had the Request by my kinsman Mr. Israel Higgins known to yourself. Jonathan Edwards’s Sinners in the Hand of an Angry God ranks among the most frequently studied and anthologized sermons in American history. But how successful was his storied performance at Enfield, Massachusetts (now Connecticut), on July 8, 1741? Detail from Thomas Jeffrys, A Map of the Most Inhabited Part of New England ([London], 1755). Geography and Map Division, Library of Congress (available online). Eleazar Wheelock’s undated letter to his parishioners in the North (or “Crank”) Parish of Lebanon may be found among the Eleazar Wheelock Papers, no 743900.1, Rauner Special Collections, Dartmouth College Library, Hanover, N.H. The missive bears a notation on the verso side in a later hand that reads “to his people at Lebanon 1743”; but the details indicate that he composed it two years earlier, on July 11, 1741. For a detailed analysis of Edwards’s itinerant activities in the Connecticut Valley during the summer of 1741, see Douglas L. Winiarski, “Jonathan Edwards, Enthusiast? Radical Revivalism and the Great Awakening in the Connecticut Valley.” Church History: Studies in Christianity and Culture 74 (2005): 683–739 (click here to download from JSTOR); and Darkness Falls on the Land of Light: Experiencing Religious Awakenings in Eighteenth-Century New England (Chapel Hill, N.C., 2017), 222–225. The definitive edition of Sinners in the Hand of an Angry God (Boston, 1741) appears in Jonathan Edwards, Sermons and Discourses, 1739–1742, vol. 22, Works of Jonathan Edwards, ed. Harry S. Stout and Nathan O. Hatch with Kyle P. Farley (New Haven, Conn., 2003), 400–435. A typescript edition of Stephen Williams’s diary produced during the 1930s by the Works Progress Administration is available online at the Richard Salter Storrs Library, Longmeadow, Massachusetts (see volume 3, pages 375–379, for his famous description of Sinners and subsequent events in Longmeadow and Springfield described in Wheelock's letter). The extract from Timothy Edwards’s letter to Wheelock quoted above was published in William Allen, “Memoir of the Rev. Eleazar Wheelock, D. D.,” American Quarterly Register 10:1 (August 1837): 12. I Came here to Winsor yesterday with a Design to Come to you this Day. The Lord Bowed the heavens and Came Down upon the assembly the Last night. The house seamd to be filled with his Great Power, a very Great Number Crying out under a sence of the wrath of God and the weight of their Guilt, 13 or 14 we Beleive Converted. My Dear Brother Pomeroy Came to me this morning from Mr. Mash’s Parish where the work was allso Great the Last night. We were Just setting out to Come home but a Number of people were met together and the Distress among them soon arose to such an heighth that we think we have a Call of Providence to Continue here over the Sabbath. Several have been Converted already this morning. There is now work Enough for 10 Ministers in this town & there is a very Glorious Work att Suffield And it was very marvellous in a Great assembly At Enfield Last Wednesday, ten or twelve Converted there. Much of his power was Seen at Longmeadow on Thursday, 6 or 7 Converted there and a Great Number wounded. There was Considerable Seen at Springfield old town on Thursday Night and much of it again yesterday Morning at Longmeadow. People Everywhere throng together to hear the word and I do verily beleive these are the beginning of the Glorious things that are Spoken Concerning the City of our God in the Latter day. I am much Concernd for Some that Remain yet Stupid and Blind. Among my Dear flock I Desire your Continual Remembrance of me your poor pastor in your prayers to God that I may be Strengthned in the inward & outward man to all that the Lord shall Call me to. I hope to be with you at the beginning of next week. Eleazar Wheelock to the North Parish Church, July 11, 1741. Courtesy of Dartmouth College Library. The Journal of East Tennessee History recently published the first of a two-part series of articles in which I chronicle the Shakers’ epic “Long Walk” from New York to Ohio in 1805. Part travel narrative, part missionary report, Shaker letters from the Long Walk shed new light on the controversial “bodily exercises” that dominated accounts of the Great Revival (1799–1805). Centered in the Kentucky Bluegrass Country, this powerful succession of Presbyterian sacramental festivals and Methodist camp meetings played a formative role in the development of early American evangelicalism and the emergence of the southern Bible Belt. The Shakers were eyewitnesses to some of the most bizarre spectacles associated with the western revivals. "The Jerks," Virginia Argus (October 24, 1804). Image courtesy of the Library of Virginia, Richmond. Spurred by a newspaper report describing an outbreak of the strange somatic fits known as “the jerks” in the remote village of Abingdon, Virginia, Shaker leaders in New Lebanon, New York, dispatched three missionaries to investigate the Great Revival and gauge the prospects for evangelizing the western settlements. At the time, sectarian followers of British émigré Ann Lee, the “Elect Lady” and purported second coming of Christ in female form, had achieved widespread notoriety for their perfectionist theology, celibacy, pacifism, communal villages, and, especially, ecstatic dancing practices. Early descriptions of the Shakers “laboring” worship, as they called it, bore a striking resemblance to accounts of the bodily exercises of the western revivals. Leading a packhorse encumbered by a large portmanteaux and bearing printed copies of a strident letter proclaiming the Shakers’ millennial new dispensation, John Meacham, Issachar Bates, and Benjamin Youngs set out on New Year’s Day, 1805. For more than two months they struggled through some of the worst winter weather of the nineteenth century. The Shaker missionaries traveled more than 1,200 miles south through New York, Philadelphia, Baltimore, and Washington, then up the Great Valley of Virginia, through East Tennessee, over Cumberland Gap, and into the Kentucky Bluegrass country—the heart of the Great Revival. By March 1805, the trio had reached the small settlement at Turtle Creek near Lebanon, Ohio. Clover Mount (Robert Tate Homestead), Greenville, Virginia, ca. 1803. Image courtesy of the Virginia Department of Historical Resources, Richmond. Along the way, the Shaker missionaries were keen to meet with Scots-Irish Presbyterian “jerkers”—men and women who had experienced unusual somatic fits during powerful revival meetings. As they passed through Greenville, Virginia, Meacham and Youngs spent an afternoon interviewing members of the family of Robert Tate, a prosperous Presbyterian elder, Revolutionary War veteran, and slaveowner, about their experiences with the jerks. The record of that conversation, carefully recorded by Youngs in a letter, is arguably the most detailed account of the bodily exercises of the Great Revival ever written. Although the Shaker missionaries moved on from Greenville, they continued to encounter “jerkers” like the Tates throughout the western settlements. Within a few years, hundreds of these radical “revivalers” and their families had converted to Shakerism and gathered together in a network of five communal villages that the missionaries organized in Ohio, Kentucky, and Indiana. “Shakers & Jerkers, Part 1” presents an edited transcription of the missionaries’ January 31, 1805, letter, in which they narrated their progress from New York to Virginia and reported their encounter with the Tate family. Scheduled for publication in the 2018 volume of the Journal of East Tennessee History, the second installment in the series will cover the Shakers’ travels through Tennessee and Kentucky, as well as their early efforts to spread the gospel in southern Ohio. It also includes an unforgettable account of a Presbyterian society meeting in East Tennessee in which Meacham, Youngs, and Bates witnessed not only the jerks, but trance walking and other unusual somatic phenomena. For colleagues seeking new readings for their courses on early American religious history, “Shakers & Jerkers” provides a vivid portrait of popular religion in the trans-Appalachian west. Graduate courses might effectively pair these edited Shaker texts with prominent studies of the Great Revival and southern evangelicalism: John Boles, The Great Revival: Beginnings of the Bible Belt (1972; Lexington, Ky., 1996); Paul K. Conkin, Cane Ridge: America’s Pentecost (Madison, WI, 1990); Christine Heyrman, Southern Cross: The Beginnings of the Bible Belt (New York, 1998); Leigh Eric Schmidt, Holy Fairs: Scotland and the Making of American Revivalism, 2d ed. (Grand Rapids, Mich., 2001); or Ann Taves, Fits, Trances, and Visions: Experiencing Religion and Explaining Experience from Wesley to James (Princeton, N.J., 1999). Readers interested in learning more about the Long Walk and western Shakerism should begin with Stephen J. Stein’s definitive Shaker Experience in America: A History of the United Society of Believers (New Haven, Conn., 1992); see also Carol Medlicott’s excellent biography, Issachar Bates: A Shaker’s Journey (Hanover, N.H., 2013).